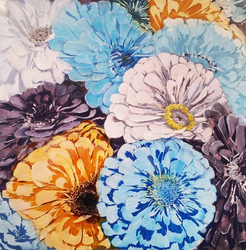 "[this] prize was awarded to Cynthia Mullins for her jewel-tone work Blue, White, Aubergine and Amber, whose captivating and lusciously rendered flower petals appear to burst from the painting’s surface," Lisa Hayes Willams, Curatorial Asistant at the New Britain Museum of American Art. 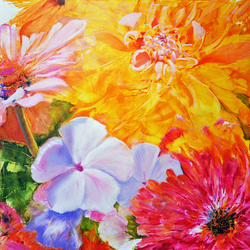 A release by the National Association of Women Artists about the show, "Expressive Women of NAWA." A Path, oil on sealed paper, 8 x 12 inches, will be published in February, 2017 in Balanced Rock, The North Salem Review of Art, Photography and Literature, published by the Ruth Keeler Memorial Library. The Visual Arts Editor is Constance Sullivan, who has produced widely-acclaimed books on art and photography for major publishers including, "Landscapes of the Civil War" (Alfred A. Knopf), "Women Photographers" (Harry N. Abrams), and "Photographers at Work" (Smithsonian Institution Press). Ridgefield Arts Council 2016 Behind the Scenes Award for work in the arts at the Ridgefield Guild of Artists. 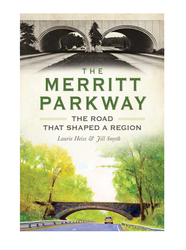 -Two paintings on the Book Cover of "The Merritt Parkway, The Road that Shaped a Region," by Laurie Heiss and Jill Smyth published by History Press, 2014. "Exit 46" a pastel and "Through the Woods" an oil. -Bookmark made by the Westport, CT library with two Merritt Parkway paintings. 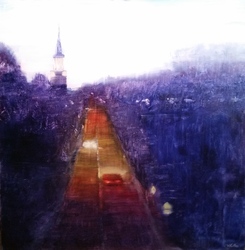 "Art of the Parkway, the Merritt inspires Cindi Mullins"
"Merritt Parkway-paintings by Cindi Mullins"
Photo and caption for "The Skies Above"
"31st Juried Exhibition to open Sunday at Guild"
photograph of "Ridgefield Treetop View"